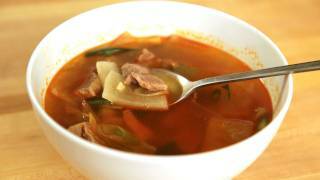 This soup is another recipe which is very delicious and easy to make. When you boil this soup, the aroma is irresistible. : ) If you like spicy food and soup, this is the perfect food. You don’t need any other side dishes when you eat this soup, but you need to serve it with rice. If you want to eat this soup and rice with a few more side dishes, don’t skip kimchi! : ) I usually dump my warm rice into the soup. Ummm! I filmed this video recipe with Mina when I visited Copenhagen, Denmark for my Gapshida project. Mina is a great cook and has a blog named Copenhagen Kitchen. We made a huge portion for our meetup party that night, and everybody who came to the party enjoyed the soup and asked for the recipe. So this soup will be a great choice for those who have to feed many people like I did in the video. 50 people or 100 people, no problem! Soup and rice, that’s all you need! But if you want to do more, serve with kimchi and more side dishes. Cut 250 grams of radish (about 2 cups) into pieces 1 inch x 1 inch and ⅛ inch thick (2.5 cm x 2.5 cm and 0.3 cm thick). Put into a pot. Cut 250 grams of beef brisket into bite sized chunks and put it into the pot. Add 1 tbs hot pepper flakes, 2 tbs fish sauce, 1 tbs sesame oil, 1 ts salt, 2 cloves of minced garlic. Mix it well with a spoon. Add 5 cups of water. Bring to a boil over high or medium hight heat with the lid closed for about 20 minutes. Lower the heat over medium heat and cook for another 30 minutes. Chop 3 stalks of green onions and add it to the soup. 1 minute later, turn off the heat. The soup is done! Posted on Friday, January 13th, 2012 at 2:11 pm. Last updated on August 7, 2017. Posted March 5th, 2017 at 6:29 am | Log in to reply. Made this tonight for a BBQ as an appetizer in case anyone was wanting something light while waiting for the food to be ready. As I’m the only one in the house who eats kimchi, I was also prepared for people to just avoid this as another of my crazy concoctions. Luckily one of the guests had spent three years in Korea and was excited to try some homemade Korean cooking. His first words upon tasting the broth was “very close”. This was high praise to me. Having never tried the actual recipe, I had no idea how to tweak it, so I was very happy to know I was close. Next time I may use shiitake broth or kelp to give it more depth of flavor. After he gave his approval, others tried it and liked it a lot. Thanks, Maangchi!! Posted March 6th, 2017 at 10:15 am | Log in to reply. I’m happy for you! Good luck with your Korean cooking! Posted April 7th, 2014 at 4:55 pm | Log in to reply. Maangchi, I love your site! I tried this soup, and while I loved the results, it took a REALLY long time to get the brisket tender. It may be that I used grass-fed organic beef. I did cut it into bite size pieces as directed. After a couple hours I ended up scooping out the radish, which had become very soft, and pouring the rest into my pressure cooker. I should have followed my intuition to use the pressure cooker in the first place! I ended up eating dinner at 10:00pm – luckily it was the weekend. :-) Instead of rice, I poured it over sweet potato starch noodles. I love the Korean radish in this soup. It tastes almost like a potato, which gives me the idea to sub it for potatoes in other soups when I don’t need them for thickening purposes. I have just started using Korean radish and I love how mild it is. In the past I’ve substituted daikon in other recipes, but the difference in flavor is huge. Posted April 4th, 2014 at 8:08 am | Log in to reply. I made this for my Korean boyfriend, and he ate the whole pot by himself! Thank you so much! From now on, I’ll be coming to this website whenever I want to make Korean food! 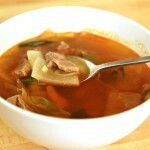 This recipe was originally posted on January 13, 2012 at 2:11 pm by Maangchi. It was last updated on August 7, 2017. The video was watched 125,340 times on YouTube & has 1,035 likes!